Australia Post is not my favourite at the moment. The other day I waited at home for a parcel that the Australia Post internet tracker told me would be delivered on that day. It never came. Then in the late afternoon I received a text message saying that I could pick it up at the local post office. No postie had knocked at my door and no "not at home" card was in my letter box. So the postie must have decided that he couldn't be bothered delivering to my place on that day - he just made a unilateral decision that he would leave it at the post office. I wonder how many others had the same experience that day. It raises a host of issues. I had paid for express delivery to my residence and was clearly short-changed. I had to catch a bus to the post office to collect the parcel, and catch another bus back home carrying the parcel. Damned inconvenient at the time for me, but what if I was someone with a disability or no means to get to the post office? What if it was urgently needed medication? What use is an internet tracking service that advises you to stay at home to collect a delivery when that delivery never occurs? How many lost hours and how much lost productivity results? I might point out that this has occurred before - several times over the last few years, in fact - so it is definitely not a one-off. The postie has actually delivered successfully at other times, so there is no physical problem that prevents delivery. Phone calls to Australia Post raise barely a flicker of interest at the other end. They tell me that the postie should make an attempt to deliver at the address, they promise to check, but still it occurs. 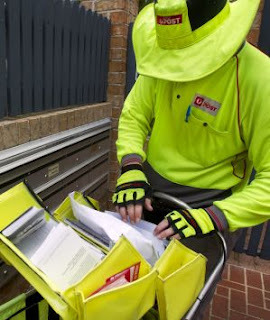 It is well documented that Australia Post's letter delivery service is losing money hand over fist. The increasing use of text messages, email services and social media where messages, photos, music etc can be sent electronically and received almost immediately anywhere in the world is obviously decimating "snail mail" as it has become known. Australia Post has indicated that it wants to focus on its parcel delivery service to replace the revenue being lost in the letter division. Well, good luck with that, because if service standards are not better than what I have experienced the competition (and there is plenty of that) will chew up Australia Post and spit out the bits. Posting a letter to an address in Australia now costs the sender $1.00! One dollar for a standard letter. I'm flabbergasted, particularly seeing that the mail transit times are increasing rather than decreasing. Increasing the unit cost is hardly likely to bring in extra customers - $1.00 for a letter vs a few cents for an SMS or email is a no-brainer, after all. Of course we all send emails today. From little tackers to great-grannies, people are emailing and texting in ever-increasing numbers. Even Clive Palmer's five year-old can send a text, apparently! It did make me think about the changes to the mail service over the years. The Australia Post web site tells me that way back in 1809 a man named Isaac Nichols was appointed to attend to all mail received in the colony of New South Wales, thus creating the first formal postal service in Australia. He was a man before his time as he operated from his home. He listed the names of those who received mail in the colony's newspaper and they came and collected their mail. Over time, mail collection became mail delivery. 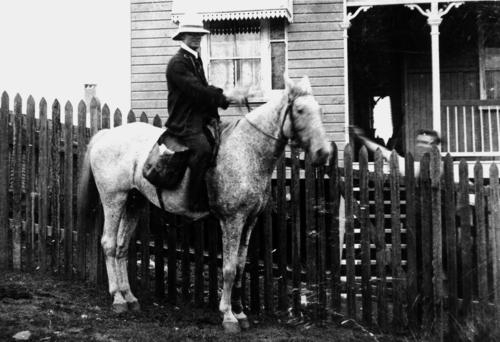 The photo above shows mail delivery on horseback in Brisbane in 1913. The postie depicted delivered mail in the Newmarket, Wilston, Grange, Enoggera and Ashgrove areas. And I bet that it was a tad more reliable than today's service. I can understand your grief with Aust Post. Quite often I have been told a letter has been sent but I never get it. Your story is not uncommon. We often have mail delivered to the wrong street or returned to sender (for no apparent reason). I share your disgust and despair... it happens so often here. Even a legal letter, sent Express Post from one suburb to the next, with all the extra costs paid, still took 5 days to arrive. Complaints fall on bored ears... they take no notice whatsoever. The first rule of business, a service is losing custom, so, increase the prices? I think not. Yes the income from snail mail has been going down and down over the last couple of years. But because people are shopping on line so much these days, Australia Post would be very wise indeed to focus instead on its parcel delivery service. My family used to receive very very few parcels each year. Now there is at least one a week, often two or three. In my neighbourhood, the postie can't even deliver the mail to the correct address - all the neighbours know each other well because we've had to deliver our mail to each other. Australia Post is ridiculous if they think offering WORSE service that costs more is going to save them as a business. This has happened at my place on several occasions - wait in for a parcel aLL day and then check the letter box to find a "come and collect it"note. The manin the post office just shrugs. I add my voice to your chorus. I fear you are not alone. It seems standard practice. Perhaps a new business opportunity will arise from the ashes.